The spectacular Cartier designs have amazed buyers and collectors of jewelry for decades because of their trend setting creations. Figurals make up quite a significant portion of the Cartier Collection, with designs ranging from bejeweled roosters to stunning tigers. This book details their designs from 1937 through the beginning of the 21st century. There are hundreds of close up photographs, as well as archival drawings and photos taken of famous people wearing the design in real life. These real life photos give a fabulous look at fashion styles from the actual time that the pieces were created, and this gives additional visual details of styles, hair and make up fashions from the period. The book discusses the rise of the firm and offers a tribute to the multiple designers responsible for the myriad of jewelry pieces sold by Cartier. The company was founded in 1847 in Paris by Louis-Francois Cartier. His son Alfred took over the administration of the company in 1874, but it Alfred's sons Louis, Pierre and Jacques who were responsible for establishing the world wide fascination with the name Cartier. At first known for watches, by the early 1900s, Cartier had branches in London, New York and St. Petersburg. 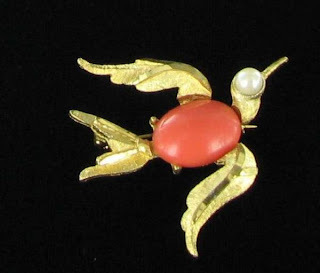 Their early Art Deco designs, in particular the use of Tutti Frutti jewels made them at the top of wealthy patrons list of jewelry designers. The book is available from leading book sellers or online from amazon.com and other internet book sellers. If you are a lover of Cartier jewelry or a vintage jewelry collector, then this book is a must have. With this year's recent celebration of 100 years of Cartier, this book goes hand in hand with the celebration and gives much of the history around the House of Cartier. 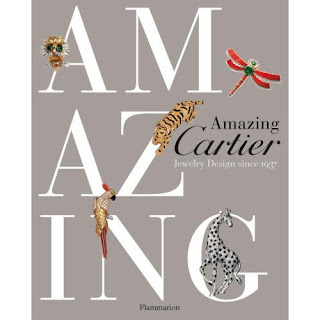 Looking through this book and seeing page after page of stunning photos of their designs, shows why the name Cartier is synomous with perfection. Labels: 100 years of Cartier in America, Amazing Cartier - Jewelry Since 1937 review, book review, Cartier jewelry, jewelry resource books. Hasn't this year flown by for you? I can't believe how one month seems to blur into the next for me. It's already time to talk about the traditional birthstone for November - topaz. (Citrine is also considered a gemstone for November.) Topaz is also the birthstone for the zodiac sign Scorpio and the gemstone for the 16th wedding anniversary. When one thinks of topaz, a warm honey color comes to mind, but the gemstone also occurs in many colors, including red, blue, violet and green. Topaz is a very durable and hard gemstone. It is rated 8 on the Mohs scale of hardness and is quite resistant to scratching. It is the hardest silicate mineral and one of the hardest minerals in nature. Topaz is a durable gemstone that's resistant to scratching. It's rated 8 on the Mohs scale (compared to diamond, the hardest gemstone, at 10). 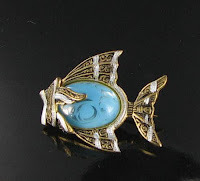 The name of the gemstone is thought by some to have come from an island Topazos, which is found in the Red Sea, and was an early source for this gemstone. Others believe that it comes from the Sanskrit word "topas" meaning "fire". Topaz stones are mentioned in the Old Testament, but many scholars believe that this reference of Topaz in the bible was actually peridot. Many scientists believe that real topaz were yellow crystals discovered in the early 1700s in Germany. The main sources of mining today of Topaz are Brazil, Sri Lanka, Russia, Australia, Africa, Mexico and Pakistan. When purchasing topaz stones, particularly the yellow variety, the buyer must be prepared. Many of the stones sold as topaz (particularly from overseas) are actually the lesser valued citrine stones. In natural form, topaz crystals can reach the immense size of several hundred pounds. Because of thier high luster, multi faceted crystals, and nice colors, Topaz can make very attractive mineral specimens. The largest faceted Topaz specimen ever found was a whopping 31,000 carat stone from Brazil named El Dorado. The rough crystal weighed an astonishing 37 kg, when discovered in 1984, and after cutting and polishing the final weight was only 6.2 kg. Other large stones include a rare, perfect blue gemstone which was discovered in the Ural Mountains of Russia in 1965. It weighed 100 kilograms and a 137 pound crystal was found in Norway in 1901 that was two feet long. Most colors of topaz are relatively common, and quite affordable, some colors like red and pink are quite rare and much sought after, so their price is much higher. As with other gemstones, Topaz has mystical properties associated with it. It has long been attributed with gentleness, integrity and fidelity and it thought to bring wearers love, wealth and protection. In physical terms, topaz is thought to aid with poor appetite, gout, blood disorders, hemorrhages, and diseases of the endocrine system. Caring for topaz is relatively easy. Warm soapy water and a soft brush will usually keep it in good condition. Because it is sensitive to sudden temperature changes, ultrasonic and steam cleaners should be avoided. Bright light can cause the stone to fade, so it should be carefully stored when not being used. El dorado photo courtesty of of Programa Royal Collections. Today's bling is such a beauty. 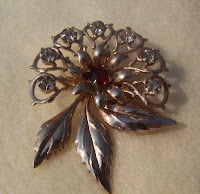 I love diamante rhinestone vintage jewelry. For one thing, the price of it is always so much lower than the colored rhinestone equivalent. They seem to be very undervalued to me. Also, diamante rhinestones will go with every fashion choice or color. They are understated and very elegant. Perfect choice for the upcoming holiday season! This pretty festoon necklace is set in silvertone metal and features a stunning design with prong set emerald cut and chaton rhinestones. Imagine this at the neck of a simple black dress for New Year's eve! Just perfect. The size of the necklace is 18" long and it has a fold over clasp. Clear and bright rhinestones for a glitzy effect. 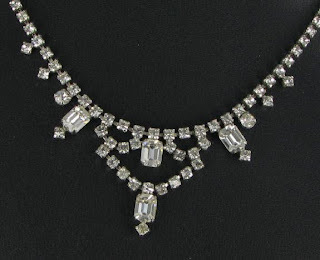 The price of this lovely festoon diamante necklace is only $49.99 so it won't break the budget. 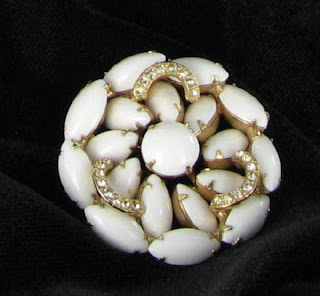 It is available from my Vintage Jewelry Lane Shop. 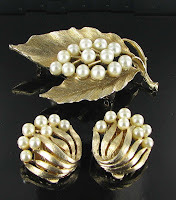 There are a myriad of finish types of the various metals which were used in the construction of vintage jewelry. 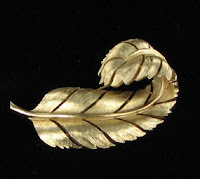 Today's vintage jewelry word pertains to one of these finishes - a Brushed Finish. A brushed finish is a type of metal finish which has no gloss at all. The process involved gives the finished product a textured finish which is much less reflective than a normal metal finish. This finish is produced by soft scratch-brushing a polished metal surface so that it produces a soft sheen. The finish is also known as a Satin finish, a Butler finish, or a scratch brush finish. 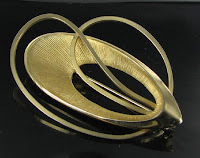 Many designers of vintage jewelry used the brushed finish, but one of the most well known and, in my opinion, one of the best manufacturers of this technique is Trifari. 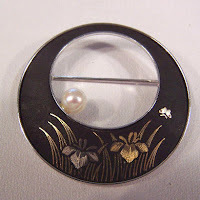 Their brushed goldtone and silvertone finishes, especially on their brooches, are superb with fantastic detail. What do you think of the finish? Do you like this style or do you prefer a higher gloss finish? The dates of operation of the company are 1914 to the present day. This blog post is another in my series about choosing jewelry suitable for individual star signs. Today's astrological sign is Scorpio, which is the sign for those born between October 23-November 21. The sign is depicted as the scorpion and it is considered a water sign. Scorpios have very magnetic and dynamic personalities. They are generally well liked and can have a soothing affect on those around them. People born under this star sign tend to be very creative and inventive and excel in professional careers such as medicine chemistry and physics. On the negative side, they can be jealous and resentful, somewhat compulsive and obsessive, as well as being secretive and obstinate. Thinking about buying jewelry for your Scorpio friend and don't know where to start? Let's examine some of these zodiac facts for a bit of inspiration. Scorpios love all types of flowers, including geraniums, black-eyed Susans, gardenias and many other types. Let's combine some of these traits and see what we can come up with for gifts that might please your Scorpio friend. Since their lucky numbers are three and five, how about choosing a multi strand necklace for them with this number of rows of beads? My Carolina Collections Jewelry Shop has a lovely range of 3 and 5 strand beaded necklaces. 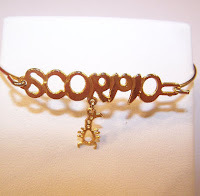 How about this goldtone Scorpio bracelet? It is a clamper style and features a cute scorpion charm dangle and is available at the give away price of $4.99 from Vintage Jewelry Mall. 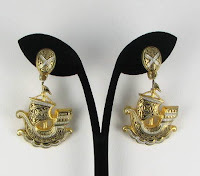 Since Scorpios love to be near the water, they would probably appreciate any piece of jewelry with a nautical theme. 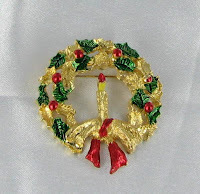 This week's vintage jewelry find is perfect for the upcoming holidays. It is a mix of the romantic and the elegant and would be great for both daytime or evening wear. This lovely bracelet features four strands of prong set diamante rhinestones and a single center strand of hand wired creamy faux pearls. 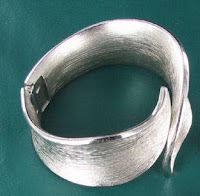 The length is 7 3/8" and it is 3/4" wide, so fits right in with the current popular trend for wide bracelets. 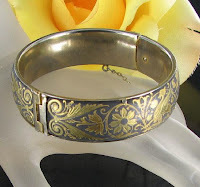 It has a secure fold over clasp and is set in goldtone metal. 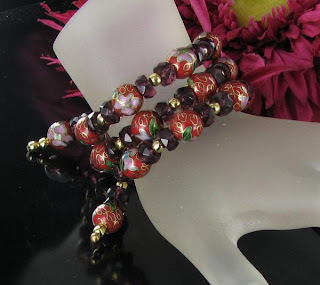 The multi strand bracelet is available from my Ruby Lane Shop - The Finishing Touch Vintage Jewelry for only $22. Hurry - it won't last long at this price. 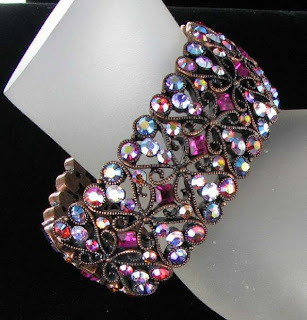 You can see more photos of this lovely rhinestone and pearl braclet as well as other details in my Ruby Lane store. Memory Wire Wrap Bracelets - Make a Fashion Statement! Readers of my blog know that I love glass jewelry of all types. It is colorful, feels substantial and so cold to the touch and has such an earthy feel about it. Also, glass jewelry is very undervalued, in my opinion, when one considers the price of glass beads. Memory wrap bracelets often use glass beads and depending on the length of the wire used, can be quite a fashion statement when worn. Some of them end up several inches wide, depending on your wrist size. My online stores all have glass memory wire bracelets for sale. 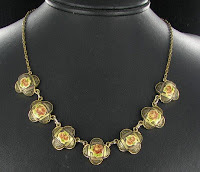 The one featured here is from my Vintage Jewelry Lane shop and consists of a fabulous combination of cloisonné enamel and faceted glass beads. The price is $22.99, and it is just stunning in both color and design. I don't normally think of burgundy and red matching well together, but on this bracelet, the combination just works for me. Feeling creative? Why not try your hand at making one of these? Head off to Michael's, get some memory wire, and glass beads and use your imagination. You'll end up with a lovely hand made creation. This month is breast cancer awareness month. I'm sure that most of you may know someone who has been affected in some way by this disease. This is the month to show support for the cause. This year is also a special anniversary - In 2009, NBCAM celebrates its 25th anniversary. Since its inception a quarter century ago, NBCAM has been at the forefront of promoting awareness of breast cancer issues and has evolved along with the national dialogue on breast cancer. While October is recognized as National Breast Cancer Awareness Month, the www.NBCAM.org Web site is a year-round resource for breast cancer patients, survivors, caregivers, and the general public. I encourage you to visit their site in October and regularly throughout the year as they add updated breast cancer information and resources. 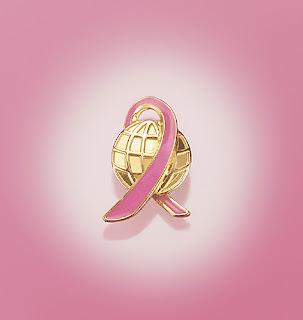 A simple way of promoting the cause is to wear a breast cancer awareness pin on as sweater or on the lapel of a jacket during the month. There are many styles available. It's nice to know that doing something so simple can possibly make a difference. One of the most fascinating area of collecting vintage jewelry is recognizing the look of the various designers who produced the lovely pieces that we like to collect and wear. Today's featured designer is BSK. BSK is a designer about whom very little information seems to be available. The company was founded in New York in 1948 and did business until the mid 1980s. (I've seen one reference book listing the 1970s as the end of production, but most researchers seem to agree that they closed their doors in the mid 1980s. )The letters BSK stand for the first initials of the three owners: Benny Steinberg, Slovitt and Kaslo. 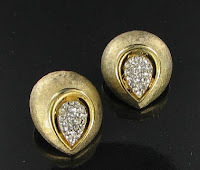 Their designs vary from simple silvertone and goldtone pieces to some particularly stunning designs with rhinestones. Overall, their designs are of average style, although very good quality. The jewelry sold well in the 1950s, when the demand for affordable jewelry boomed after the war time period. 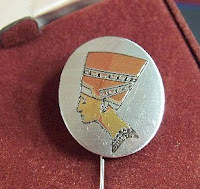 The BSK line was reasonably priced and was sold in department stores such as Woolworths. It was normal during this period for mothers and teachers to receive BSK designs as gifts because of the competitive price point. One particularly interesting series that the company did was called My Fair Lady, and this is featured in many vintage jewelry reference books at better than average book values. Consider this a real find if you come across one of these highly collectible pieces! The design characteristics of BSK pieces are the use of colorful enamel designs, with the base metal often dipped in the enamel. They made some whimsical designs. 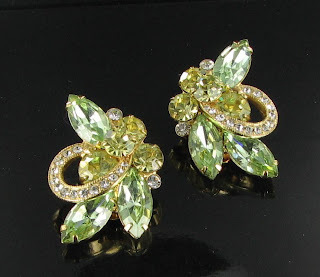 Their rhinestone pieces often used Aurora Borealis Rhinestones, in combination with enamel. Many of their designs featured a feaf style of overlay. BSK designs had very little variation in their markings. Most pieces were signed just with the letters BSK in block lettering, either directly on the metal, or on a metal cartouche added to the design. 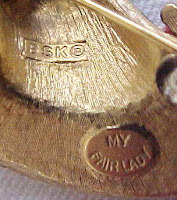 The collectible My Fair Lady designs were marked BSK © My Fair Lady . Here are some pictures of BSK designs which show both the simplicity and elegance characteristic of their designs. BSK jewelry is not particularly expensive to buy and is still relatively easy to find. Don't buy pieces with flaws, since they will not warrant repair costs to fix them. If possible buy sets instead of single pieces. BSK is prized by some collections of vintage jewelry for the lovely combination of enameling and rhinestones, so the pieces should slowly rise in value. Today's jewelry bling isn't vintage but I love it just the same. The piece is a stunning aurora borealis rhinestone bracelet by Joan Rivers. This bracelet comes from her Classics Collection and has never been worn. It features a filigree bronzetone setting with wonderful pink diamond shaped rhinestones and stunning aurora borealis rhinestones in a wide stretch style. It is just stunning. The sparkle and fire of the rhinestones has to be seen to be believed. The size of the bracelet is 1 1/8" wide and it is strung on two stretch elastics to fit most wrist sizes. The bracelet is marked Joan Rivers China on the inside. It comes in a velvet pouch and original Joan Rivers gift box. (Slightest of wear to the box.) It is in very fine condition. 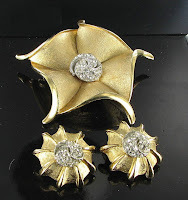 While not considered vintage items, Joan Rivers jewelry is very collectible. The colors of the stones in this bracelet, coupled with the metal finish, make it a perfect piece for fall. It reminds me of leaves when they are changing colors. 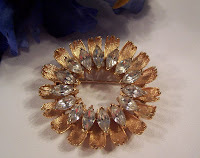 For more pictures details, you can view the stunning Aurora Borealis Joan Rivers bracelet on Vintage Jewelry Lane. Price is $49.99. What a wonderful Christmas present this would make for someone special in your life. This year is a blur to me. It has flown by so quickly and here we are in autumn again with Christmas just around the corner. Every year, as I get older, the years seem to go by more quickly! 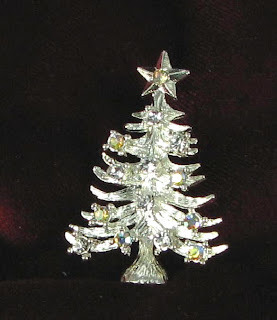 I've just purchased a new collection of Christmas jewelry from the designer Gerry's. This company was founded in the 1950s by Geraldine Giles and closed its doors in 2001. The company was founded in New York, but moved later to Folcroft, Pennsylvania. 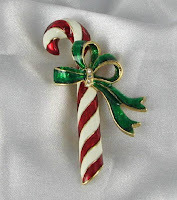 Their designs were often small metal figural pins, and especially Christmas pins, which were decorated with enamel and rhinestones. Gerry's jewelry has always been collected by those who collect vintage Christmas jewelry, but the pieces may now start to rise in value, since the company is no longer in business. Here are a few choices. 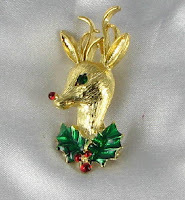 You can view more of these Christmas jewelry pieces at my Vintage jewelry Lane and Vintage Jewelry Mall sites and at my Finishing Touch Vintage Jewelry store on Ruby Lane. 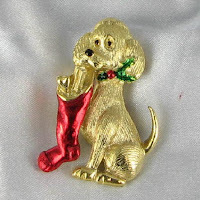 Prices range from $8.99 to about $18, so they will make cute and inexpensive Christmas gifts. You can click the pictures for more details and photos or follow the links above to view the whole collection. Beat the rush by starting your Christmas shopping early. You will get the best choices and avoid the rush in December! 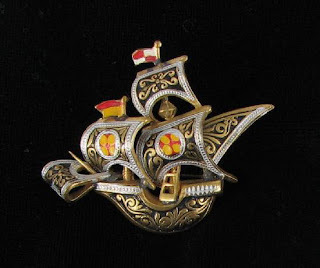 Yesterday's blog discussed the fabulous exhibition at the Museum of Arts and Design for Madeleine Albright's wonderful collection of brooches and pins. As mentioned in the blog post, Ms. Albright also has a new book out called Read My Pins: Stories from a Diplomat's Jewel Box which also gives a look at the 200 brooches as well as outlining the stories behind them. I am always interested in new books which deal with vintage jewelry, so I was particularly interested in this book, since so many of her brooches are vintage. The book is a fascinating story and discussion about how one woman's personal jewelry collection was used to make diplomatic history. The book explores the use of the brooch as a means of personal expression, and in the case of Ms. Albright, as a diplomatic expression. It features galleries of stunning photographs of the jewelry and gives new insight into the personality of Secretary Albright, who was secretary of state during the Clinton administration. Before long, and without intending it, I found that jewelry had become part of my personal diplomatic arsenal. Former president George H. W. Bush had been known for saying "Read my lips." I began urging colleagues and reporters to "Read my pins." Be sure to check your local media outlets for more events like this. Her exhibition at MAD in NY will be going on until January 31, 2010, so I expect there to be many more book signings and events like the luncheon. Read my pins features more than 200 photographs as well as lively stories about jewelry, global politics, and the career of one of the world's most respected and fascinating public servants and diplomats. It is available at leading book retailers and many online book websites, including Amazon.com.